Inspiration and Practical Tactics for anyone plotting their political ambition. 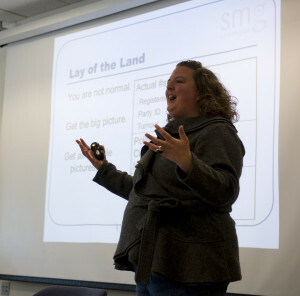 Shannon Garrett, founder and president of SMG Strategies, has become a leading political trainer, campaign strategist, and candidate coach. Her commitment to helping others – both women and men – embrace their political ambitions and plot their paths to office has brought her to communities throughout the United States, where she has trained thousands of individuals and worked alongside hundreds of candidates and elected officials. Shannon's dedication to creating a more active and diverse democracy has led her to work with numerous organizations on a national level from coast-to-coast. Shannon takes the stage to inspire and teach individuals with political ambition to make that ambition into a reality. We are booking speaking engagements and trainings at least three-months in advance. Book a session now or connect with Shannon about what she can bring to your constituents. Shannon spoke at Forward Action Michigan-Ottawa and Allegan County focusing on women running for office, why we need women in office, common opportunities and challenges for women running, and how to bring an authentic voice to public debates. Shannon led a discussion on importance on diversity and inclusion in government, highlighting the vital perspectives and voices women bring to the table at the Saugatuck Douglas Rotary Club.